"Didn't you hear me? I'm the perfect servant. I have no life." At first consideration, Robert Altman seems like exactly the wrong filmmaker to make a whodunit. When the director's films are at their best, plot isn't their strong suit�M*A*S*H is little more than a series of blackout sketches about war, for instance, and even The Player, which is more or less a murder mystery, isn't especially interested in unraveling the mysteries of its story. (Does it matter who it is that's blackmailing Griffin Mill? Altman doesn't seem to think so, and hence neither do we.) Most scenes in most movies ask pretty much the same question: What happens next? But with Altman it's different—he's more interested in behavior than in story, and almost seems to be commenting, "Aren't people funny? Look at how we behave." So in Gosford Park, Altman uses the form of the screen mystery to his own ends, and the story is a convenient pretext for the investigation of certain aspects of human behavior, and a sociological look at the British class system between the two world wars. It's a recognizably Altman film, with full offscreen lives given to or suggested for even the smallest character; and happily, it's not especially concerned with Colonel Mustard, in the conservatory, with the candlestick. All the action is confined to a weekend at a grand country house in November 1932, and whereas the Agatha Christie version of this sort of story would examine exclusively the hosts and their guests, the aristocracy, Gosford Park is at least as much about the downstairs as it is about the upstairs—that is, the army of cooks, maids, valets and other servants necessary to keep such an enormous operation running. It's the conceit of the storytelling (as the filmmakers describe in the supplemental materials) that we as an audience witness only what the servants see—when we're upstairs with the lords and ladies, there's invariably a butler waiting at table, or a ladies' maid hemming a dress. And one of the points is that the upper classes, while not unkind to the help, treat the servants as so many pieces of furniture—there's nothing they won't say or do merely because the valet is in the room. Someone in fact does get murdered, and the story is tidily resolved in its final minutes; but that's not the point of the picture. What's marvelous about Gosford Park is its specificity—that applies to each of its characters, who have a sure sense of who they are, what they want, and what their relationships are like to those around them; to the duties of each of the servants, who don't dust in a very general way, but perform their tasks like driven professionals, if it's pouring the tea just so (tea first, milk second, thank you very much), or seeing to it that every last bit of silver is laid at just the right angle before dinner is served. My only quibble might be that the movie occasionally draws too much attention to itself as a movie. Bob Balaban plays Morris Weissman, an American film producer invited along, and he's forever on the phone with California, trying to work out the casting for his newest picture, a Charlie Chan murder mystery. The constant reminders to the audience—it's a movie murder mystery inside of a movie murder mystery, get it?—are unnecessary and not wholly convincing, though it does provide an opportunity for the upper classes to express their distaste about popular culture. Weissman is asked about the movie he's working on, and is reluctant to give away the ending—he's encouraged to do so, however, as Lady Constance Trentham (Maggie Smith) promises him, "None of us will see it." Image Transfer Review: Andrew Dunn's handsome photography has transferred well to DVD. Interference is at a minimum, the colors are nicely saturated, and the black level is deep and true. There can occasionally be a sort of gauzy look, but that seems to be from the cinematography, not the transfer. Audio Transfer Review: For a film set almost entirely indoors, the surround speakers are put to fairly good use. Each of the actors were individually miked, so the dialogue is especially clear; still, with lots of overlapping, it can sometimes be a struggle the first time through to determine just who is speaking, and to whom. 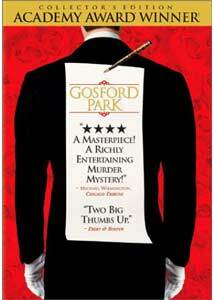 Extras Review: For a murder mystery, Gosford Park is a movie that gives up more secrets on repeat viewings, and the filmmakers on the commentary tracks are fine guides. On the first, the director is joined by Stephen Altman, the film's production designer (who is also the director's son); and by David Levy, one of the producers. Altman talks about putting in enough profanity to ensure an R rating: "I didn't want fourteen-year-olds coming in off the street. They wouldn't like it." Levy is especially good at peppering the director with questions, and drawing him out on production choices. The camera is always moving, for instance, though it's sometimes just barely noticeable; and while those upstairs were given the full pancake treatment, the actors playing the servants wear almost no makeup. I especially liked the comparison of Mrs. Wilson, the housekeeper played by Helen Mirren, with Mrs. Danvers from Rebecca. Screenwriter Julian Fellowes flies solo on the second commentary track, which is almost a seminar in the bygone ways of the English country house. (He points out another lift from Hitchcock, this one from Suspicion.) Fellowes seems to have been uniquely well suited to write this script, as his family is apparently chock full of characters much like the ones upstairs, and he relishes telling stories about their eccentricities, many of which made it into his screenplay. There were rosters of unspoken rules at these homes, and the clueless Americans here inadvertently break many of them—Balaban's character is a vegetarian, for instance, and Fellowes tells us that the aristocrats thought that "the worst thing you can do is fuss about your food." He also has a writer's clarity about his characters, and fills in offscreen story points that are alluded to, but may elude your grasp even after repeat viewings. Without the imperative of pushing the story forward, it must be difficult to know which scenes to cut for length, and so the package of fifteen deleted scenes (20m:03s) is especially instructive. Many of them concern Ryan Phillippe's character, and a handful emphasize the alcoholism of Jennings, the butler played by Alan Bates, forever sampling the port. Altman, Altman and Levy provide a commentary track for these as well, pointing out that some of the deleted scenes were shot as alternates for scenes that ended up in the final cut, two different routes to the same place. The Making of Gosford Park (19m:51s) features Altman, Fellowes and many of the cast members, most of whom are working with Altman for the first time. Kristin Scott Thomas expresses her initial concern that Altman's unorthodox method might lead to the "survival of the loudest," but she and everyone else seemed to have figured things our fairly readily. The Authenticity of Gosford Park (8m:40s) presents the film's technical advisors, former servants who remember these glory days of the English country house. Especially winning is Arthur Inch, now in his 80s, who rose up through the ranks to butler: "I grew up in service, so at the age of fifteen, I was able to utter these immortal words: 'Dinner is served, madam.'" Also here is a Cast and Filmmaker Question and Answer Session (24m:59s), shot in Los Angeles in March 2002, featuring Altman, Fellowes, Levy, Balaban, Kelly Macdonald, Mirren, Jeremy Northam, and a late-arriving Phillippe. Everyone refers to the director as "Bob," but for Balaban, who (perhaps because he is a Bob himself), for reasons known to him alone, insists on calling Altman "Robert." The four other trailers are for other Universal DVDs (they're billed as Coming Attractions), and along with a Gosford Park trailer, filmographies are provided for sixteen of the actors, and eleven members of the production team. Prepare the clotted cream and scones, Jeeves, and serve them 'round the DVD player. This is a fine movie with an especially insightful package of extras that make the prospect of return visits to Gosford Park most pleasurable indeed.